This will keep in the fridge for at least a week. I store mine in a glass container. Freeze what you will not use in in that time. Cover with about 2 cups of fresh spinach. 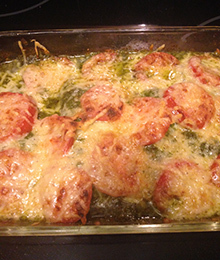 Top spinach with flattened chicken breasts. Top chicken with a heaping tablespoon of pesto on each piece. Spread evenly over each chicken piece. Top pesto with organic roma tomato slices... I used about 5, cut into 1/3 inch thick pieces. Top pesto with about one cup of white cheese. I used a blend of mozzarella, parmesan, asiago and romano. Bake at 400° F for about 30 minutes until chicken is done and cheese is browning. 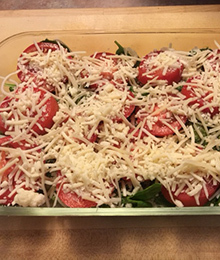 This dish can be served alone as a light supper or with crusty bread, pasta or wild rice to help soak up the flavorful juices from the fresh tomatoes. In addition, one could cook 1/3 cup (raw measurement) of wild rice to place on the bottom under the spinach, which would help soak up the juices as well. Do not overcook the rice so it can still absorb the juices.